Michele Colavecchio first appears in the Painesville, Ohio, area in 1897, at age 3. In America, Michele Colavecchio was known as Mike Colavecchio. Michele Colavecchio, son of Bartolomeo Colavecchio and Palma DiCristofaro, was born on March 7, 1894, at Frosolone, Italy. He married Maria Concetta Cerce, daughter of Vincenzo Flaviano Cerce and Filomena Tartaglia, on January 24, 1920, at Cleveland, Cuyahoga County, Ohio. Michele died on May 10, 1976, at Lake County Memorial Hospital, Painesville, Lake County, Ohio, at age 82. His body was interred at Riverside Cemetery at Painesville, Lake County, Ohio. 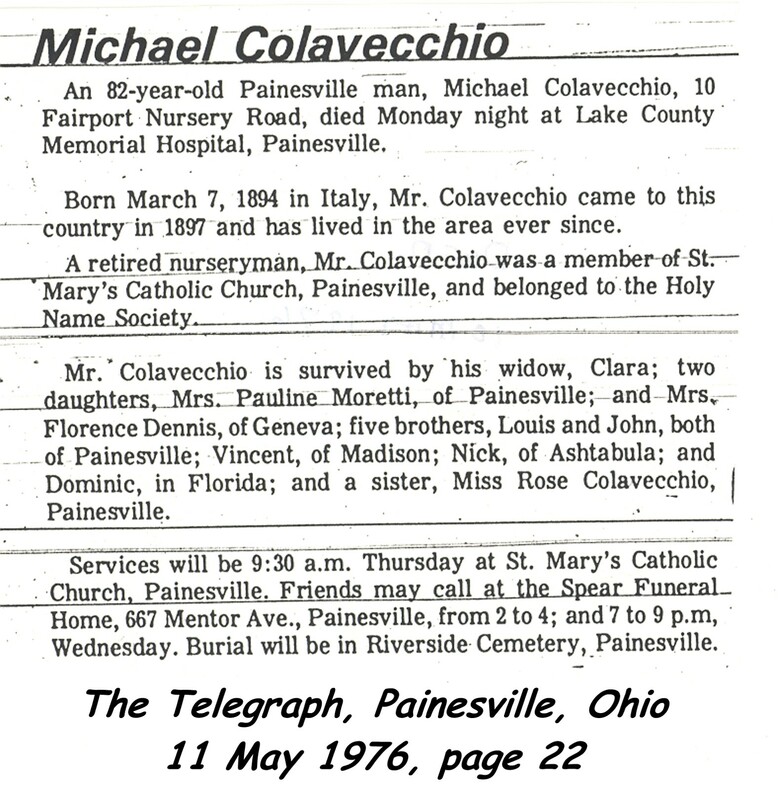 Michele Colavecchio immigrated to the United States on May 27, 1897, at age 3, travelling to Painesville, Lake County, Ohio, with his mother, Palma DiCristofaro. 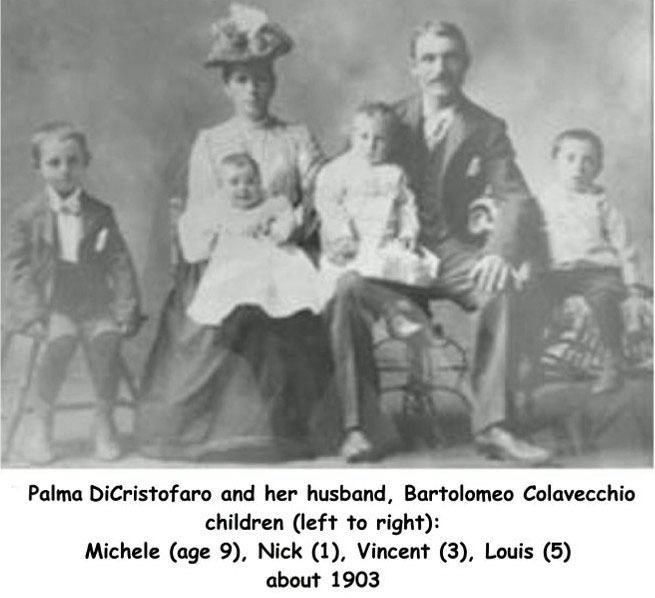 They were joining Michele’s father, Bartolomeo Colavecchio, in Painesville. Mike Colavecchio registered for the World War I Draft on August 26, 1918. He was living at Painesville Township, Lake County, Ohio, at the time. He was employed he was employed by the Storrs & Harrison Nursery. He was a nurseryman all his life. 1. Pauline Colavecchio was born about 1921. She married Nicholas R. Moretti, son of Dominic Moretti and Ida Comino, on June 26, 1947. Pauline died on June 20, 1988. 2. Florence Colavecchio Cerce was born on September 12, 1929. She was married to James Dennis.